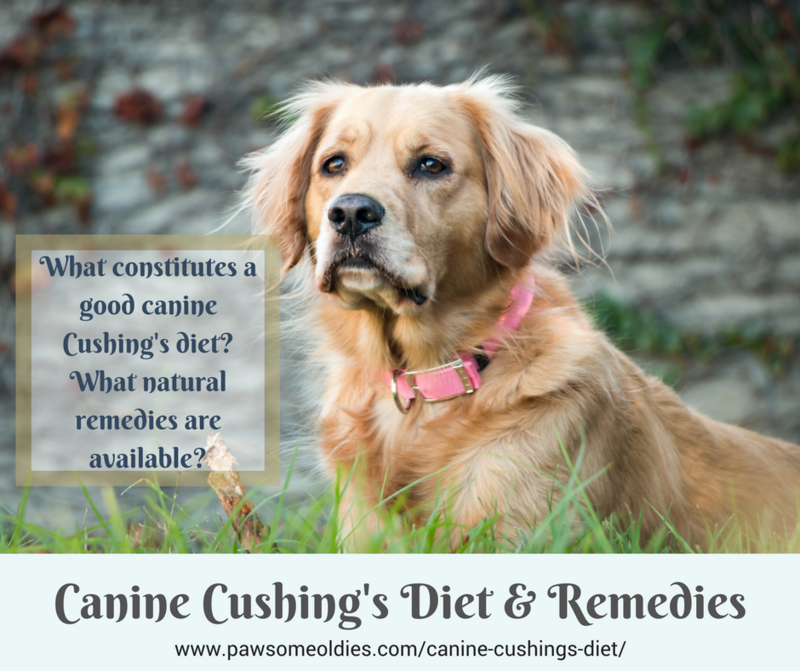 This post is about using a canine Cushing’s diet, supplements, and natural remedies to help dogs with Cushing’s disease. Canine Cushing’s disease is prevalent among older dogs. About 100,000 dogs every year in the USA are diagnosed with this disease. The average age of diagnosis is around 10 to 12 years old. In my previous post, I wrote about the two types of Cushing’s disease, their risk factors, symptoms, diagnosis and conventional treatment. If you have read that post, you will recall that conventional treatment of Cushing’s in dogs is limited and far from perfect. As a result, more and more dog parents are looking at holistic treatment for canine Cushing’s. 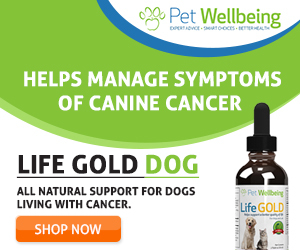 Particularly, they opt for using a natural diet, with supplements and remedies, to help lessen the symptoms caused by this disease and to boost the immune system of the dog. This approach is especially viable if the symptoms are limited and not severe. Sometimes, holistic vets also use remedies and diet in addition to conventional drug therapy, in order to reduce the drug dosage and the accompanying side effects. We should therefore bear that in mind when designing a diet for dogs with Cushing’s. We don’t want to include ingredients that put the dog at higher risk of developing the above health issues. A good canine Cushing’s diet should contain fresh, high-quality food ingredients, preferably home-cooked. Fresh food ingredients contain more nutrients and are easier to digest and absorb. They can more readily boost and enhance a dog’s immune system weakened by Cushing’s disease. The diet should be high in animal proteins to compensate for the loss of muscle mass and tone caused by Cushing’s. A high-protein diet is also good for the immune system. As dogs with Cushing’s are prone to calcium oxalate bladder stones, avoid overfeeding the dog excessive amounts of calcium. Use food ingredients that are low-oxalate. Also make sure that the dog has access to fresh clean water 24/7. Having the dog drink plenty of water can prevent bladder stone formation. To reduce the burden on the digestive system, feed smaller meals more frequently if at all possible. For example, instead of feeding two big meals in the morning and evening, feed 3 to 4 meals throughout the day. If you home cook for your oldie with Cushing’s, think “low glycemic”, “low oxalate” and “low fat” to reduce the risks of diabetes, pancreatitis, and bladder stones. In other words, use low fat animal protein sources and food ingredients (e.g. veggies) that have low glycemic and low oxalate values. Together, these food ingredients can help reduce the risks of your dog developing diabetes, pancreatitis, and/or bladder stones. Low fat animal protein sources can be skinless chicken breast or turkey breast, lean ground beef, venison, rabbit, scrambled eggs, low-fat cottage cheese, low-fat yogurt, etc. The protein should constitute about 75% of the diet, with the remaining 25% being veggies and fruits. By now, you are probably wondering what kinds of food ingredients are both “low glycemic” and “low oxalate”, right? Vegetables: Carrots, broccoli, Brussels sprouts, white cabbage, cucumber, cauliflower, mushrooms, green peas, string beans, zucchini. Fruit: Apples (core and seeds removed), bananas, cantaloupe, watermelon. Fish: All fish (except sardines) and shellfish. Dairy: Cheese, cottage cheese, eggs, yogurt. Meat: All meat and poultry. If, for whatever reason, you cannot cook for your oldie, then make sure you get a high-quality commercial diet that is grain-free, and has named animal protein sources (e.g. salmon meal, chicken meal, venison, chicken meat…) as the first 2 to 3 ingredients on the label. Also, try adding fresh foods to each meal as a “topper”. Food items that you can add include scrambled egg, low-fat cottage cheese, low-fat yogurt, lightly cooked lean ground beef, steamed chicken meat (no skin), pureed cooked low-glycemic low-oxalate vegetables, etc. To help reduce the burden on the pancreas, give a digestive enzyme supplement to your dog with meals. The digestive enzyme supplement can help pre-digest fats in the stomach. Fish oil (such as Salmon Oil ) is a highly beneficial supplement for dogs with Cushing’s, in many aspects. Why? Because fish oil is rich in Omega-3 fatty acids, which has powerful anti-inflammatory properties. As mentioned above, dogs with Cushing’s are prone to quite a few health problems that have “inflammation” as their very nature. Like, skin problems, UTIs, diabetes, kidney disease, and heart disease. Also, research has shown that Omega-3 fatty acids can lower blood pressure. 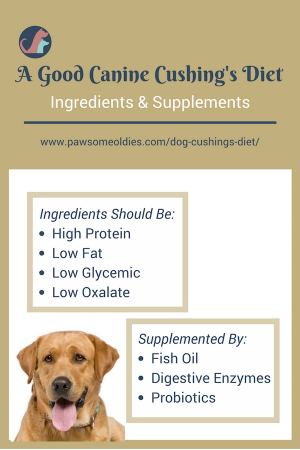 So you can see by adding a fish oil supplement to the diet, you are protecting your oldie against a lot of the health issues that dogs with Cushing’s are susceptible to. Probiotics help balance the gut flora in your dog’s digestive system. A probiotic supplement such as VetriScience Probiotic for Dogs is particularly beneficial if your oldie has been on antibiotics for, say, a urinary tract infection or skin infection. Even if your oldie has not been on antibiotics, probiotic supplementation can help strengthen the intestinal lining, thereby reducing the chance of bad intestinal bacteria entering into the blood stream. This lowers the risks of infections and boosts immune health. With all the nasty side effects of conventional drugs for canine Cushing’s, many dog parents opt for natural remedies to help their oldies. Herbs that support the adrenal glands, the liver, and the immune system are beneficial to dogs with Cushing’s disease. This product contains adrenal-supporting herbs such as Ashwagandha root, Holy Basil leaf; liver-supporting herbs such as Milk Thistle, Blessed Thistle; immune-support herbs such as Astragalus, Turmeric; and more. Anecdotal reviews from dog parents are excellent. Like all herbal remedies, don’t expect result overnight. 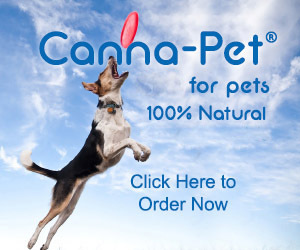 Wait at least 10-14 days to evaluate whether the product works for your dog or not. The College of Veterinary Medicine, University of Tennessee, suggests using Melatonin to help dogs with Cushing’s disease. But the response time varies with dogs, and it may take up to 4 months to see results. The same University and some vets also suggest lignans (e.g. flax hull lignans) as they can decrease cortisol levels in the body. There are two types of lignans that can be used. One is HMR Lignans , which is from the Norwegian Spruce tree, and the other one is Flaxseed Lignans , which contain mainly SDG lignans. Both types of lignans seem to have the same effect. According to Dr. J. Oliver of the University of Tennessee, lignans are safe, so doses don’t have to be exact. He also suggests using melatonin and lignans together for added efficacy. Pssst! Did you know that you can also use lignans to make dog treats for your oldie? Grab a simple recipe here! Some holistic vets also suggest TCM to help dogs with Cushing’s. In particular, one Chinese herbal formula called Si Miao San (Four Marvel Pills) seems to help decrease inflammation, improve digestion of food, and regulate insulin levels. I can’t stress enough that before giving your dog any of the above supplements and/or remedies, talk to your vet first. Some of these remedies may change the dosage of conventional drugs needed to control your dog’s Cushing’s.